August 15th is the most important day for indians around the world. Independence day for us indians is a big occassion like any other festival. Once my dad took us for an independence day celebration in his office. The airforce office were all decorated and with all the jets and helicopters for us youngsters to gaze upon. That day my dad was in a parade, and it was so proud for us to see him in uniform and march along. In my School we all used to come dressed in white uniform standing in line and singing various patriotic songs in unison. The first few years i failed to understand the value behind it, i could not understand us standing under scorching sun and listen to some special guest giving his long long speech. But the sweet which were waiting for us were the usp for the day. Once in our history(one of my fav. subjects) lessons we started to learn about the freedom struggle and the 'n' number of martyrs behind this divine cause. Now this day had much more importance for me as a person. The independence day parade which happens in redfort(laal kila) New Delhi honoured by the Prime Minister and President of India is one of the most eye-catching scenes you will ever see. 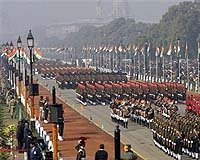 It is telecasted in national television across india, and i used to adore watching the parades. Every State showing their glory and flourishness as a theme on top of a big truck. The armed forces exhibiting their skills and weaponry. Young students parading with pride and giving the big salute to the president of india.It still remains as one of my biggest dream to attend this function live. In our neighbourhood, early morning at 7 we used to celeberate independence day too. Our ward councellor used to hoist the flag and give speech about Gandhiji and freedom struggle. The freedom fighters in our locality are honoured and they too do not fail to speak a few words of wisdom to us kids. Years have gone by, still independence day has not lost its glitter and importance in our heart and souls. One of the reason that shows our country is in right direction. Hey I think you got confused between the Republic Day parade and Independence Day speech. 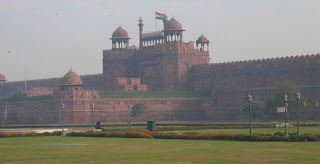 The I-day event (is a speech by the PM than a parade)takes place at the Lal Qila, like you mentioned, and the R-day parade passes from Rajpath and culminates at Lal Qila (Red Fort). By the way, despite staying in Delhi all this while, I still haven't managed to attend the R-day parade even once. It remains on my things to do list and I hope to strike it off that list come January. By the way I didn't know Elayacha was ever a part of the I-day march. Wow, I'd have loved to see that.